I just finished this book new kindle book. 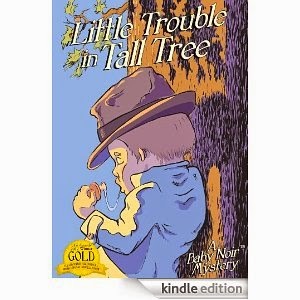 This one is called Little Trouble in Tall Tree by Michael Fertik. This book is on Amazon for $1.99 here. This book is about baby gangsters. I mean the main guy is Squeezy the Cheeks. The character you follow is Mommas Boy. So they want to pull off this big milk heist and need Mammas boy's help to do it. They want him because of what he pulled at the bank. There is a rival gang who is trying to cause trouble in their territory even lol. I wonder if my baby thinks the same things that these guys thing. She better not be in a gang. She better not be chasing after some boy. I hope that she does like the taste of her fingers. Ok, I know that she likes the taste of her fingers because like the babies in this book they are always in her mouth lol. Also, I know that she would want to be in this gang because they are trying to pull off the biggest milk heist that Tall Tree has ever seen. Buy the book and see for your self if they can do it.